Orange Blossom Suite - Key West Vacation Rental Suite - Near Duval St. Welcome to sweet paradise! Located pn Petronia Street, the Orange Blossom Suite is in close proximity to all the fun-filled action of Duval St; however, it is private enough to not hear any of it! Orange Blossom Suite shares a huge back patio with one other suite (Deckside Suite; managed by us), and includes a relaxing hot tub and BBQ grill. Walk to fine dining or cook your own meals in your fully-equipped kitchen that includes a stove, oven, dishwasher, microwave, blender, and toaster! The loft bedroom has an ultra-comfy king-sized bed, but there is a also a full-sized sleeper sofa in the living area. There is a shared pool one block away. 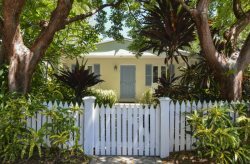 Orange Blossom Suite is one of three units that comprises the group property Conch Republic Cottages. The three cottages can be booked separately or as a group. Individual making the reservation must be 25 years or older with proper identification and be an occupant of the property. This property has a possibility for a reserved parking spot for $10 per day, but there are only 3 parking passes shared with 5 units, so let us know immediately if you need a parking pass. If all 3 parking passes are taken, you are responsible for finding your own parking. The maximum people allowed in this property is 4. If there are more than 4 people are in your party upon arrival, your party will be asked to leave without compensation. Violation of ANY house rules will result in your party being asked to leave without compensation. Parking: This property has a possibility for a reserved parking spot for $10 per day, but there are only 3 parking passes shared with 5 units, so let us know immediately if you need a parking pass. If all 3 parking passes are taken, you are responsible for finding your own parking. Pets: Pets welcome; some restrictions apply. Must be pre-approved by management. Smoking: Smoking only permitted outside. Location: Half-block from Duval Street in the heart of Old Town Key West.